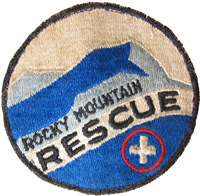 In January 1947, the Boulder County Sheriff called several local mountaineers to look for a lost little girl. Despite their best efforts the search was unsuccessful and the girl's body was later discovered close to her mountain home. Tracks in the snow revealed that the searchers came within a few feet of where she was later found. It will never be known if this tragedy could have been prevented had there been an organized mountain rescue team available to respond to such emergencies. Her death and others in the mountains that winter brought concerned community members together at a public meeting at Boulder High School. A steering committee was formed to investigate the formation of an organized search and rescue organization. Steering committee members included: Duvall, W. C., Everson, A, Hollister, H., Hutchinson, C. A., Hutchinson, C. A., Jr., Long, E. C., Mace, S., McNair, A. J., Pederson, J., Snow, B. R., Weaver, C. N.
On March 5, 1947 at the Sheriff’s Office in the Boulder County Courthouse, the steering committee became the founding members of the all-volunteer Rocky Mountain Rescue Group. Charles A. Hutchinson was the first chair of RMRG. Other early members such as Dexter Brinker, LeRoy and Alice Holubar, Meg Kershaw, Bill Sears, and Chuck Reich helped guide the group into a structured organization in its early stages of development.